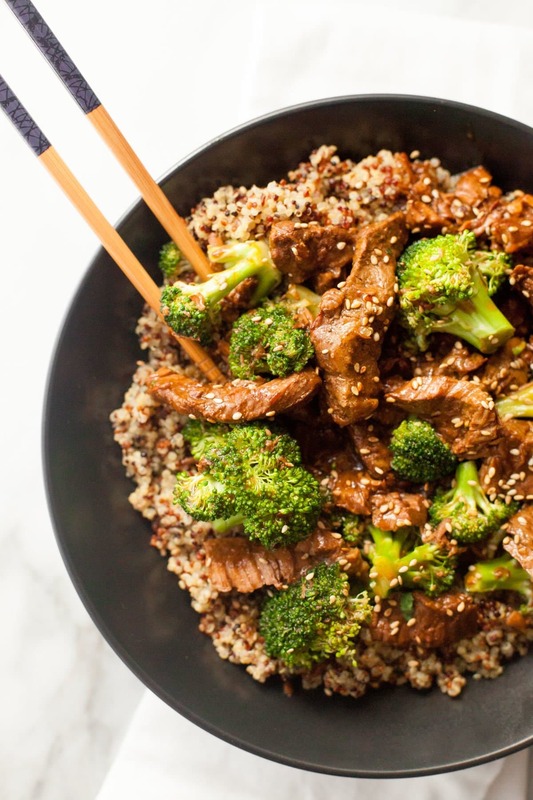 Elevate your slow cooking with Slow Cooker Beef and Broccoli with Quinoa. 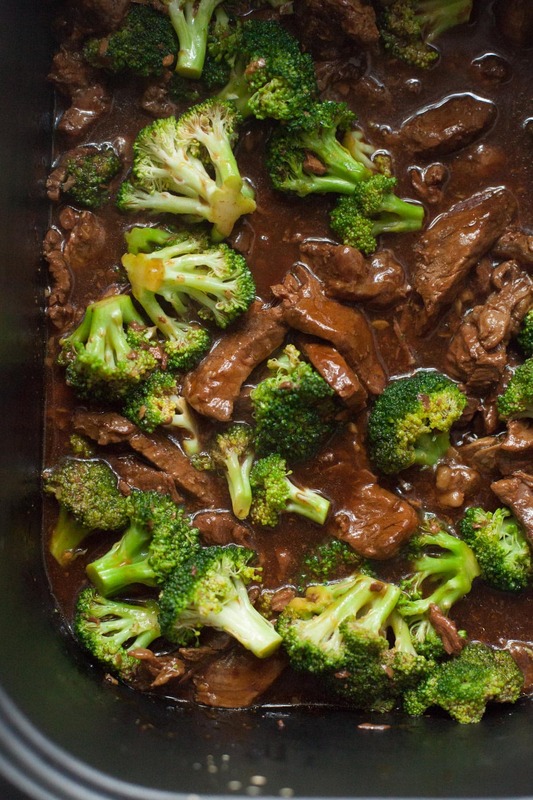 A few simple tricks will result in fall-apart tender beef and just-crisp broccoli, all smothered in a silky smooth sauce. I never liked Chinese food growing up. Every now and again, my parents would try to serve up some stir fry or fried rice in hopes that my tastebuds would have changed (they loved the stuff), and every time, I would get queasy at even the smell of soy sauce. It just wasn’t my thing. Then, in high school, I started dating a guy who ate from a local takeout place all the time. Not wanting to be high-maintenance or bossy or any of those other things 17-year-old girls worry about when they are trying to impress a guy (none of which I worry about now, by the way—33-year-old Cass is way more self-assured than 17-year-old Cass), I went along with it. I ended up not hating the food whenever we’d order it. I mean, it wasn’t my favorite, but it wasn’t so bad. At least, the taste wasn’t. The worst part about it was how I felt after we ate. I always had a headache. My stomach was always super upset. I just felt plain yucky within a few hours of our takeout feast. The guy and I ended up breaking up when I headed off to college (you say you saw that one coming, what? ), and the end of that relationship also ended my relationship with Chinese food. No one in my life really pushed the issue when I said that Chinese food makes me sick (writing credit to LFO for that one). So I didn’t eat any Chinese food for a good decade or so. Then, about a year ago, I was doing some research about food allergies and stumbled onto some forum post where some random internet person mentioned that they thought they disliked Chinese food, but really, they found out, they disliked the way MSG (which many takeout Chinese food restaurants still use) made them feel. I started thinking about how I felt about Chinese food, and realized that, in my noggin, I was tying how I felt about the flavors to how I felt after eating the food. I thought I didn’t like soy or ginger or sesame, but actually, I just didn’t like how MSG was making me feel. I just didn’t know about it. Right around the same time, a client asked me to develop a stir fry recipe. At first, I thought, uh-oh, and then I realized, hey, maybe this is my chance to get reacclimated with Chinese food? Out of that assignment came my Healthy Chicken Stir Fry, and let me tell you, I LOVED it (and my Chinese food loving husband loved that soy sauce made an appearance in our house). And, guess what? Since there was no MSG, it didn’t make me feel yucky. Not even a little bit. Woohoo! Now that I’ve figured out that I actually *like* Chinese food (just not MSG), I’ve started to playing with introducing myself to Chinese food at home. 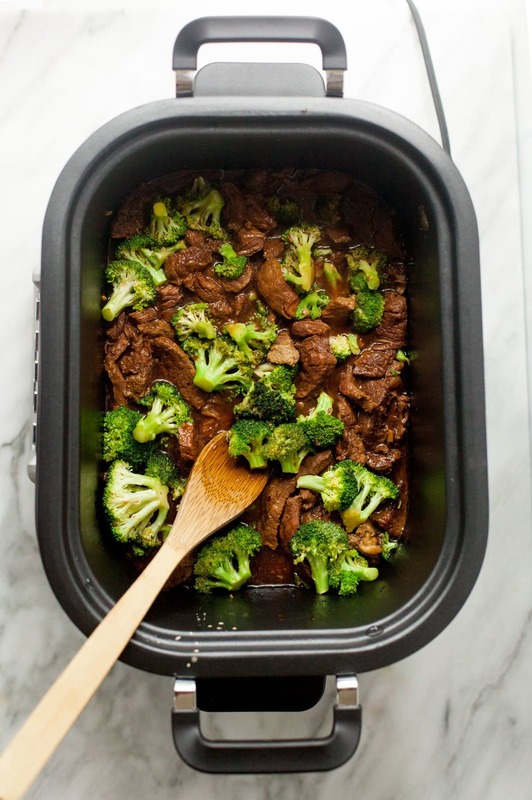 This Slow Cooker Beef and Broccoli is my latest experiment, and let me tell you, it is delicious, healthy, and totally not what you’d expect to normally come out of a slow cooker. Slow cooker recipes have this reputation of being nothing more than mushy veggies and mealy meat, but I truly believe there is art to slow cooking. 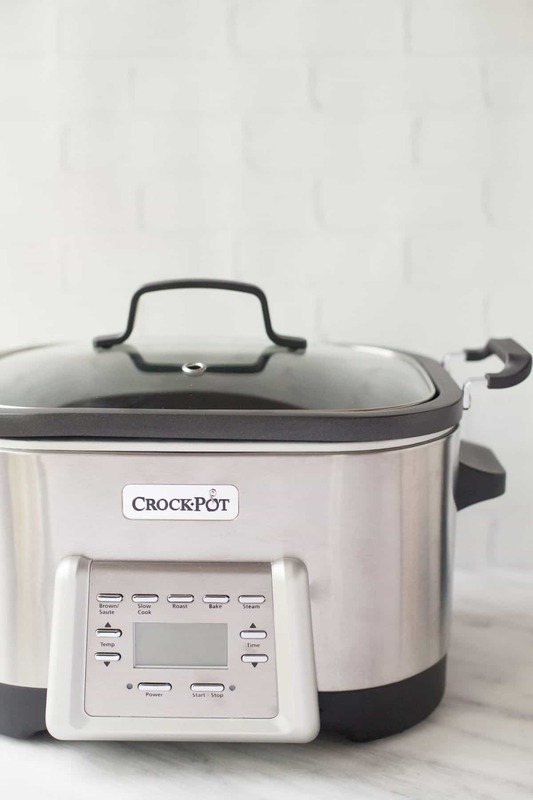 It’s not just about taking a shortcut (although, hey, anything that can make life easier is a win in my books), but you can really use your slow cooker to enhance your cooking. Yes, you can make flavorful, creative, and interesting dishes in your slow cooker—all without a hint of overcooked vegetables. If you’re trying to get into healthy eating, I believe a really great slow cooker is vital to your kitchen arsenal. 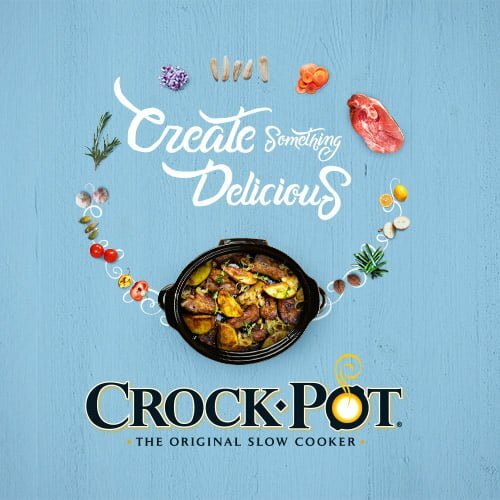 I made this dish using the newest love of my life—my Crock-Pot® 5-in-1 Multi-Cooker. This baby is life-changing. It slow cooks like a boss, but it’s the added features that really make it over-the-top awesome. Honestly, you could pretty much take this Multi-Cooker with you to the middle of nowhere (just as long as middle of nowhere has electricity) and have just about everything you need to cook an awesome dinner. Sauté, steam, roast, slow cook, bake—it does it all. I’m way obsessed. Brown, baby, brown. If you’ve ever noticed all the condensation on the lid of your slow cooker after it’s been going for a while, you know that slow cooking is a very moist method of cooking. That’s great for tenderizing food and adding moisture, it isn’t so good for getting a good sear on meat. Brown food is delicious good. Before you put meat in to slow cook, you should sear it over high heat to really add lots of yummy flavor. You can do this in a skillet, but I actually just do it on the Brown/Sauté setting in my Crock-Pot® 5-in-1 Multi-Cooker. Fewer dishes = happier me. Time it right. Tossing everything in the slow cooker and letting it do it’s thing for eight hours has it’s place, but if you’re really looking to elevate your slow cooking, you’ll want to play with timing. Meat will take the longest to get nice and tender. Harder veggies like potatoes and carrots can head in next. And then, right before serving, you’ll want to add things like pasta, rice, and other grains, or tender veggies like the broccoli in this recipe. Don’t (always) cook the dickens out of it. Seriously. I know part of the appeal of a slow cooker is that you can turn it on before work and come home to dinner ready—and that really does work for some dishes, but not all. Take this recipe, for example. It cooks in the slow cooker in just a few hours. Any more than that and you’ll get shredded meat and mushy broccoli. Sometimes your slow cooker is a precise tool instead of a wrecking ball that you use to beat your dinner into submission while you’re at your office, k? 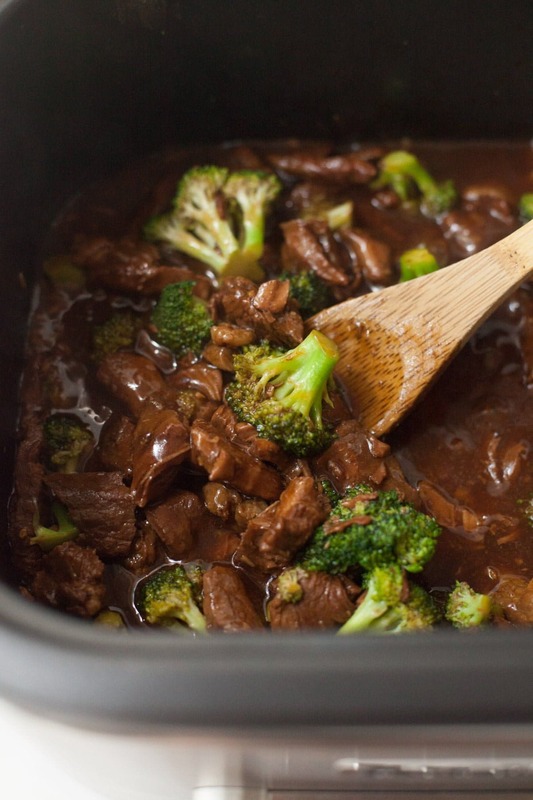 In this case, using the slow cooker results in beef that is so fall-apart tender, it feels buttery (something you’d be hard-pressed to get using any other cooking method), and broccoli that is fresh, tender, and just a little bit crisp. All smothered in a silky smooth sauce. 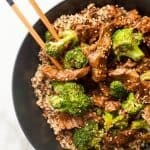 I served my slow cooker beef and broccoli over fluffy quinoa. I love adding quinoa to dishes like this because it gives you the same “feeling” as standard white rice, but a ton more nutrition. Quinoa is packed with protein and whole grains! If you prefer, you can serve this over white or brown rice, farro, or any other whole grain. Enjoy! Set your slow cooker to the Brown/Sauté setting (see the note below if you don’t have this option), and put the steak into the basin of the slow cooker. Sear for a few minutes per side, just until the outsides of the meat are browned. Whisk the beef broth, soy sauce, honey, sesame oil, rice vinegar, garlic, and red pepper flakes in a medium bowl. Pour over the beef. Cover the slow cooker, and cook for 2-4 hours on low, or 1-2 hours on high. Meanwhile, cook the quinoa in the chicken broth in a medium saucepan. To do so, cover and bring to a boil, then remove the lid and simmer until all of the liquid is absorbed, about 15-20 minutes. Scoop 1/2 cup of the sauce out of the slow cooker, and whisk it with the cornstarch to create a slurry. Add the cornstarch slurry and the broccoli to the slow cooker, and cook for 10-15 minutes, until the broccoli is tender. 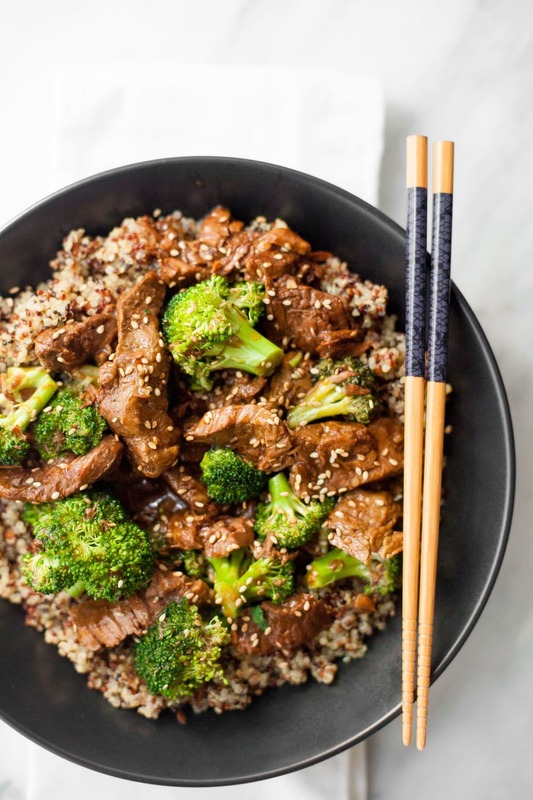 Serve the beef and broccoli over the cooked quinoa. Garnish with sesame seeds. If you don’t have a slow cooker with a Brown/Sauté setting, do this to sear your meat: Heat a stainless steel or cast iron skillet over high. Add the steak to the pan in a single layer (you may need to do this in batches). Cook for 1-2 minutes per side, just so that the outside of the meat gets browned and a bit caramelized. 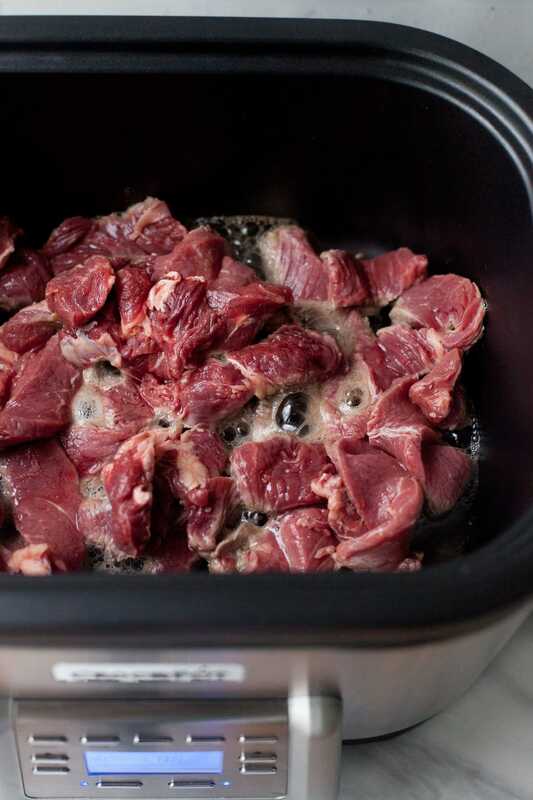 Transfer the beef to the basin of the slow cooker. I am totally with you on the MSG! UGH, hate the way I feel after eating “chinese” but I’ve always loved the flavors. I just didn’t get the connection between MSG and takeout (because my moms stir frys never made me ill).Luckily, there is a local place near where I live that has a totally MSG free menu and their takeout is BOMBBBBB. Plus, as an added bonus, they have a “light” sauce option which is less sugar and less salt (they make their sauces from scratch per order! Glad you have grown to love Chinese food! What cut of “steak” are you using? I used ribeye, because it’s all my grocery store had in grass-fed—but you could honestly use just about anything. The slow cooker does such a great job of cooking beef, you can even use lower quality cuts of beef, and still get great results. It’s been 20 minutes and the broccoli is nowhere near tender…it’s set to high. Wait what? You can brown things in that slow cooker? That’s a total game changer if you ask me. So cool! I’m sorry, but your story is incorrect and you are spreading false information. MSG had nothing to do with your issue. You may have just gotten over your food hang ups, but there is not a single shred of scientific accuracy that MSG causes any problems, let alone headaches. It is one of the most abundant amino acids in nature and in many foods we eat. If you got headaches from MSG in chinese food you would have gotten them from things like tomatoes and cheese which are also full of natural MSG. Needless to say I won’t be trying your recipe and you should stop spreading false information. WELL I DISAGREE WITH YOU ON THE MSG BECAUSE ANYTHING I EAT THAT HAS MSG IN IT MAKES ME VERY SICK..
Goodness, Jeremy, lighten up! I love Chinese food but I often do not like the way I feel afterwards. I found a great little Chinese restaurant a few years ago that uses no MSG both places use soy sauce (which I avoid when cooking and substitute with coconut aminos) so its not the soy sauce; truly the difference is the absence of MSG. I don’t feel bad when I eat there. Some people do not have a sensitivity to MSG but some do. My poor niece looks like a blow fish after eating MSG and is a great indicator of false advertisement. 2-4 hours for cooking is a very wide range. Is there a variable that determines the correct time? Coming from someone with celiac disease, it sounds like what made you sick was maybe the gluten in the soy. Many people don’t know that there is gluten in soy which can definitely give you a headache and upset stomach if you have sensitively to gluten. I can’t wait to make this with gluten free soy. Thanks for sharing! I’ve never had a reaction to gluten before (I’ve done two elimination diets in solidarity with my husband), but I do know that it can be a real struggle for a lot of folks!